Dental Implants Cost More - Are They Worth It? Is The Cost Of A Dental Implant Worth It? Dental implants cost more than ALL the other alternatives for replacing a missing tooth. The all-up figure to have a tooth replaced by a dental implant starts at around USD2,000 and can go all the way up to USD5,000. For ONE tooth. Having the protection of health insurance can help with some of these expenses, but a lot of times the cost of major dental work will still fall to the insured.There are two main reasons why dental implants cost so much. First, dental implant treatment takes a LOT of time! This is your dentist's time - more appointments are needed than for, say, a normal fixed bridge. A lot of this time is taken up before you even have any implant surgery, by planning, and trying to anticipate potential dental implant problems. AND THEN after dental implant surgery, you need several follow-up appointments with your dentist, to check on the healing process and make sure everything is going to plan. And we haven't even got to putting a crown or bridge on the implant yet! You can read more about the different types of dental implants HERE. After three to six months, your dentist can then start the process of constructing the crown or bridge that will be fitted to your new dental implants. (Dentists call this the implant superstructure). More appointments, more of your dentist's time, more dollars. Can you start to see why dental implants cost so much? Second, the materials and lab work are way more expensive than for a conventional crown or fixed bridge, too. The laboratory work is more demanding, needs to be more precise, and so takes up more of the technician's time. While the lab technician's rate will not be as expensive per hour as the dentist, he may well spend MORE HOURS than the dentist working on your case. Again, more time = more $$$. To find out more about the cost of a fixed dental bridge, go to my page Dental Bridge Cost. For a closer look at why dental implants cost so much, have a look at the page tooth implant cost. HOWEVER, if we look at the RESULTS of all this time spent by the dental professionals - what are you getting for your money? Dental implants are stronger than anything else, and will also last much longer than a conventional fixed bridge or crown. The equivalent fixed bridge (fixed partial denture) will always be cheaper upfront, at the time you get it, BUT getting a bridge will involve grinding down the teeth on either side of the gap, to make room for the caps or crowns that hold the replacement tooth in place. Most conventional fixed bridges last about 12 to 15 years, some longer. Then you need to get it replaced, and pay again. BUT one of the commonest reasons for a bridge failing is actually a problem with one of the supporting teeth UNDER THE BRIDGE. So this means probably having to get that problem tooth pulled, and getting a slightly bigger bridge to correct the extra missing tooth! Dental implants cost more upfront, but over a 20 or 30 year period will probably end up being the least expensive option! Having dental implant treatment overseas is now a realistic option, and can be very cost-effective; Dentistry Abroad is certainly worth looking at and investigating. But be sure to ask ALL the questions, including how many appointments will be needed. I recently worked for 5 years in a dental office that specialized in dental implants . I got to see the failures as well as the successes, and how dental implant costs depend on how complicated the situation is. For sure, things like bone grafting and dental sinus augmentation procedures can drive up the cost of dental implants even more. I tell my patients that it is like an artificial tooth root. They are usually about the size and shape of a normal tooth root. They are made of surgical-grade titanium, although Ceramic Dental Implants are also available. Ceramic dental implants cost about the same as normal titanium implants. The picture above shows a titanium implant supporting a dental implant crown, next to natural teeth. 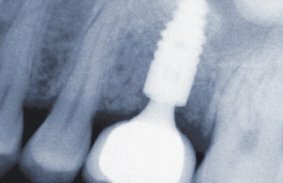 A dental implant replaces a tooth root that has been lost, for whatever reason. Maybe the tooth broke, or you got an abscess, and had to get it pulled. It doesn't matter too much. All you know is, you have a gap where you used to have a tooth. When you are faced with losing a tooth unexpectedly, especially a front tooth, it can be hard to know what to do. It's easy to feel pressure to make a decision one way or the other, either for an implant or for a bridge. But you don't have to make your mind up straightaway. There are a couple of possible short-term options that will buy you some time. Sometimes a very quick "fix" is a dental flipper. This is a very small partial plate or denture that can fill the gap as a temporary measure. If you're getting an implant, a dental flipper is also ONE option to fill the gap while the implant is healing. Another option is an adhesive bridge, sometimes called a Maryland bridge. The main advantage is that it does not require any neighboring teeth to be trimmed down for a crown, the way a conventional fixed bridge does. A Maryland bridge can be "glued" or bonded to one or two teeth next to the gap. The disadvantage with a Maryland bridge is that it will only work if there is enough room for the little metal bonding tag to fit behind the neighboring tooth when you bite down. Also, sometimes the bond can come off, and you have to get the bridge re-fitted. Both of these temporary tooth replacements will give you some time to think about whether to get a dental implant or a fixed bridge. You can click on the following link to read about Dental implant pros and cons. Your dentist has a legal obligation to explain the advantages, disadvantages, possible risks and potential benefits of both treatments. He must also explain any special conditions that may affect your particular case, for example if you smoke or have diabetes. These both increase the risk of dental implant failure. If you decide to have an implant, it is important to know that the dental implant itself is roughly only about HALF of the TOTAL tooth implant cost! A dental implant is only a tooth root. You need the replacement tooth, too. After all, the only reason to have a dental implant is to get a new tooth! IN ADDITION, you may need a bone graft to help support the new implant, which will increase the cost of the treatment, as well as extending the overall treatment time required. But you can't get the tooth put on the implant right away. Normally, you have to wait for a time to allow for dental implant healing. This is the healing process where the implant becomes fused to the bone. Dentists call it "osseo-integration". So, after a dental implant has been put in, and healed up (about 3 months), your dentist has to take another mold of your teeth, including the top of the implant. Then his dental laboratory can make the Dental implant crown. 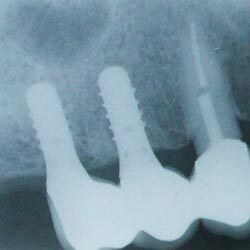 This crown is then screwed or cemented onto the top of the implant. You have to think of dental implants cost being in two bits; half for the dental implant itself (the new "tooth root"), and half for the new crown and screw system that joins it to the implant. The advantages of dental implants are that they are very strong and are extremely unlikely to fracture. Dental implants do not decay. Getting a dental implant to replace one missing tooth means that the dentist does not have to grind down the teeth on either side of the gap, like he would for a fixed bridge. The disadvantages of dental implants are cost and complexity. Dental implants cost more than the alternatives. The tooth implant cost for a single tooth will nearly always be about 50% more than the equivalent fixed bridge, for example. Read about Dental Implant vs Bridge here. Dental implants can also be complicated, requiring several appointments over a period of months. Good planning and a skilled dentist are also essential to success! Dental implant complications. There are a number of complications which may crop up. They usually result in the whole dental implant process taking a bit longer, but are not critical in most cases. Dental implant infection. Any infection to do with a dental implant can be serious. Not for your general health, but for the survival of the implant itself. Dental implant pain. Getting dental implants almost always involves a degree of discomfort afterwards, as things heal up. The degree of discomfort depends on a number of factors. Dental implant failure. A dental implant can fail at almost any point in its lifetime, from within weeks of getting it placed to years later. Here you can find out more about possible reasons for failure. Peri-implantitis. This is a low-grade chronic inflammation around the neck of an implant, that can slowly cause problems if it is left untreated. Something a lot of people ask me about is Immediate Load dental implants. But you must know about the limitations! Immediate load implants are only suitable in certain situations. Dental implants should generally NOT bear any weight or load until they have fully healed and become fused to the jaw-bone. ONE technique that recommends immediate loading is the All On 4 Dental Implant treatment technique from Nobel Biocare. Here are my opinions on some of the top dental implant manufacturers. The dental implant industry has grown very quickly, and a lot of small companies have appeared producing dental implants that look identical to well-known established brands. But sometimes these new implants have simply copied the existing designs, without fully understanding the reasons for certain features. Astra Dental Implants are one of the best dental implant producers, and I recommend them. If you are fed up with loose dentures, and want to find out how to make them stay in place reliably, take a look at denture implants, which will anchor your dentures down in place. These dental implants cost less than ones that support a fixed tooth. There is also more information about this on the Dental Implant dentures page. An alternative, for LOWER dentures only, Dental mini implants may be a solution! But again, make sure you know about their limitations. Dental mini implants are really only suitable for the lower jaw. There is a slightly different viewpoint presented at Mini dental implant. If you're interested in how dental implants came about, you can read the fascinating story at Dental implant history. It details the accidental discovery by Professor Branemark that titanium is the ideal material for dental implants, and the struggle he had to get his ideas accepted! At the end of dental implant treatment, if everybody has done their job properly and the implant is successful, you will have a new tooth or teeth that look and feel like natural ones. Dental implants cost more than the alternatives, but they will last much longer! Your own dentist will be able to advise you about the alternatives that are suitable for you.